The City’s Contractor, Ghilotti Bros, has widened Freitas Parkway heading eastbound as drivers approach the intersection. This roadway widening will allow for the extension of the existing bike lane up to the traffic signal. Recently the traffic signal operations were modified such that the existing left turn lanes on Freitas could be closed off for construction activity. The City understands that from time to time there may be additional delays getting through the intersection; however, the current configuration does allow for all turning movements to continue as well as allowing the Contractor to safely perform his work. 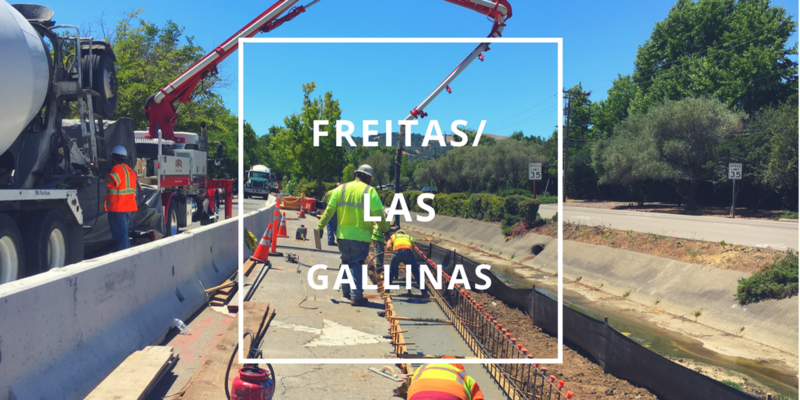 Additionally, the Contractor has installed new sidewalk on the southwest corner (i.e., the park) as well as on the northwest corner of Las Gallinas heading north to Hyacinth Way. The electrical contractor has worked over the past few weeks to confirm we have no utility conflicts where the proposed traffic signal poles will be installed. This work has been difficult, especially on the northeast corner where AT&T has several utility cabinets both above ground as well as below ground level. The City’s next steps include working with AT&T to either adjust or relocate existing telephone cables that cross the drainage ditch on the east side of Las Gallinas. This is necessary in order for the City to construct the new bridge improvements at the intersection. Additionally, the electrical contractor is working to install a temporary traffic signal system in which traffic signal lights will hang from cables spanning across the roadway. Once the temporary traffic signal system is in place, the Contractor can remove the old traffic signal poles and continue installing new wheelchair ramps and sidewalk. Concurrent with this work, the Contractor will install retaining walls adjacent to the drainage ditch. This work is already underway in the left turn lane for eastbound traffic on Freitas.